The term xerophyte refers to a plant species that has evolved over time to survive in dry regions, like deserts, with little water. Xerophytes have adapted to be able to hold onto large amounts of water for a long period of time or limit water loss. Without these capabilities, the plants would die, as their arid environment does not provide enough water to sustain life. Some of these plants store the water in their round stems. Often, leaves are not prominent, such as in the case of cacti. This is because the process of transpiration can cause water vapor to diffuse out of the leaves which would leave the plant without its necessary resource, water. 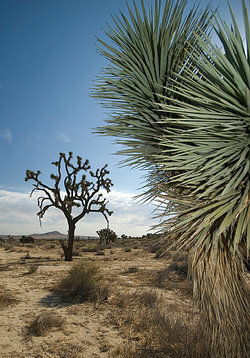 In addition to not having leaves, the overall surface area of a xerophytic plant may be less than other plants because exposure to air by the plant's surface can result in a water reduction due to evaporation. Xerophytes must work hard to intake a great deal of water when possible. This is made possible through their deep root and wide root systems, and often growth located below the water table. Water is stored after it has been taken in through succulent leaves and stems or fleshy tubers. Now you have seen lots of examples of xerophytes, and you know where they are found, you can go and find some for yourself. Share other examples with us below. "Examples of Xerophytes." YourDictionary, n.d. Web. 19 April 2019. <https://examples.yourdictionary.com/examples-of-xerophytes.html>.